Everybody starts out somewhere. 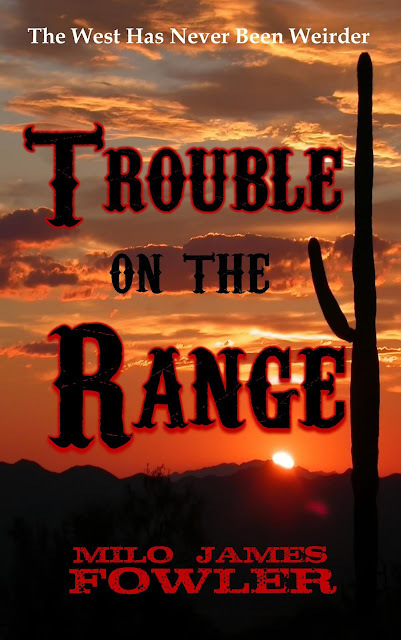 For Coyote Cal and Big Yap, famous heroes of the Weird West, it was Trouble on the Range: 30 episodes of action-packed mayhem written by a 15-year-old kid with way too much imagination (and free time), filled with enough plot twists to make your head spin. When Jack Jones's ranch is overwhelmed by foul pests, he seeks out Coyote Cal and Big Yap for help. But our heroes run into their own trouble along the way, captured by a wicked fiend intent on taking over their 30-episode serial and making it his own. In the process, the author is also kidnapped, sending events spiraling out of control. As the plot unravels, unlikely allies must unite to save the day.